J. D. discussed how he became interested in the Civil War and the Battle of Gettysburg. How his collection of documents and books led to him becoming an accomplished author of many books and articles on Gettysburg. 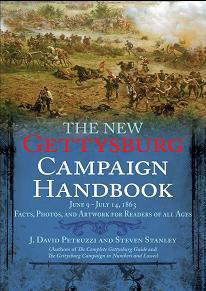 His latest book, The New Gettysburg Campaign Handbook, takes you from early June to the end of July. His friend Steven Stanley did the layout and all the maps. The book is part of a series of Civil War books published by Savas Beatie. J. D.’s new project is working on a television miniseries to be aired in 2013. J. D. gave us an interesting and educational presentation. 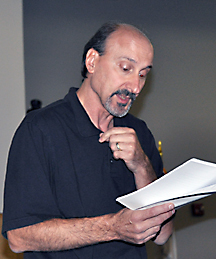 Known to most folks as just “J.D.”, J. David Petruzzi has been a life-long student of history. Although his primary interest is the American Civil War, he also enjoys studying all aspects of American and world history. Following his graduation from The Pennsylvania State University, J.D. became more serious about studying the Civil War. His special penchant is for the cavalry, so he began researching the mounted arms of both sides. He visited many repositories such as university and historical collections, the U.S. Army War College, and National Park Service and other government archives and began gathering a large amount of primary source material. J.D. also began collecting books, and now has a primary and secondary book collection of Civil War and related topics that numbers about 4,000 volumes. He soon began reenacting, often portraying a Union cavalry officer. J.D. began writing articles on cavalry and Gettysburg topics for popular Civil War magazines such as America’s Civil War, Civil War Times, Blue&Gray, and The Gettysburg Magazine. Most of his articles dealt with little-known, obsolete events during the war, events that he enjoys discovering, learning about, and teaching to others. J.D. wanted to begin writing books about the subjects he loves, and in 2006 his first book appeared (co-authored with Eric J. Wittenberg) titled Plenty of Blame To Go Around: Jeb Stuart’s Controversial Ride to Gettysburg, which opened to wide acclaim. Since then, J.D. has authored several more books with many more in the works. He also was a Historical Adviser and actor in two television docudramas produced at the time. In early 2011, he was selected to be the Historical Advisor for an upcoming television miniseries, set to air in 2013, titled To Appomattox. Written and produced by screen writer Michael Frost Beckner (Spy Game, CSI, The Agency) and directed by Mikael Salomon (Band of Brothers, Rome) the eight-part series follows the lives and careers of main characters Ulysses S. Grant, Robert E. Lee, William T. Sherman, and James Longstreet. Living in western Pennsylvania with his wife Karen and their dachshund Buddy, J.D. works steadily on his book projects. The owner and manager of a successful insurance brokerage, in his free time J.D. also enjoys gardening, fishing, and watching movies. This entry was posted in Meeting archive on September 12, 2012 by hlj.